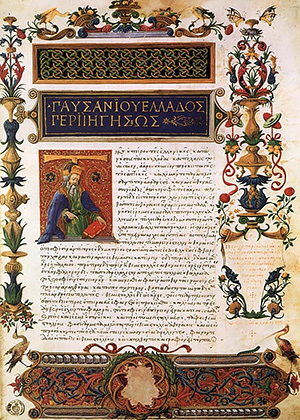 Fifteenth-century manuscript of Pausanias's book on Greece. From Wikimedia Commons. Pausanias was a Greek scholar who lived during the second century A.D. Well educated and well connected, he traveled in Greece and Asia Minor, taking in the local antiquities and writing accounts of what he saw. Some historians believe that he was also a doctor. Pausanias believed in the Greek mythology of the day, including creatures such as griffins, giants and satyrs, but he made practical interpretations of organic remains, arguing that the skeletons of supposed giants he encountered had belonged to mortals, not deities. Historian Adrienne Mayor describes his Guide to Greece as "a rich source of paleontological discoveries and interpretations made in his own day and in the more ancient past." Pausanias once interviewed a man who lived along the banks of the Hellespont, in what is now Dardanelles, Turkey, and who had seen what he believed to be the giant skeleton of the Greek champion Ajax. Pausanias recounted the man's description of the hero's kneecap as "exactly the size of a discus for the boy's pentathlon." Considering discuses thrown by adult athletes range from 6.5 to 9 inches, this would put the size of Ajax's kneecap at 5 to 6 inches across. Two things about this description are important. One is that it's about the same size as the patella of a Miocene mastodon or rhinoceros. The other is that it's not exactly the estimate you would make for a hero's kneecap if you were trying to impress with hyperbole. In fact, the writings Pausanias left behind repeatedly demonstrated his critical thinking. "The beast described by Ctesias in his Indian history, which he says is called martichoras by the Indians and man-eater by the Greeks, I am inclined to think is the tiger," he once opined. On another occasion, he reflected, "Those who like to listen to the miraculous are themselves apt to add to the marvel, and so they ruin truth by mixing it with falsehood." The Mediterranean Basin wasn't always filled with seawater. Millions of years ago, it was dry land connected to Eurasia and Africa. The area was home to mastodons and other prehistoric pachyderms, rhinos, giraffes, cave bears, and saber-toothed cats. When encountering the fossils of these unfamiliar animals, ancient peoples sometimes shoehorned them into well known myths. Three-foot-long fossil tusks were matched up with the only tusks animal locals knew: the boar. Those tusks must have once belonged to the gigantic Calydonian Boar killed by Atalanta and Meleager. More familiar animals got less fantastical explanations. Pausanias made pretty matter-of-fact observations about fossil shells, describing fossiliferous limestone as "soft and extremely white, with seashells all the way through it." Combining folklore with level-headed observation, Pausanias left for later generations an account of Greek antiquities both colorful and useful.